Bannockburn which is one of those places in Scottish history with a deep significance to the Scots. 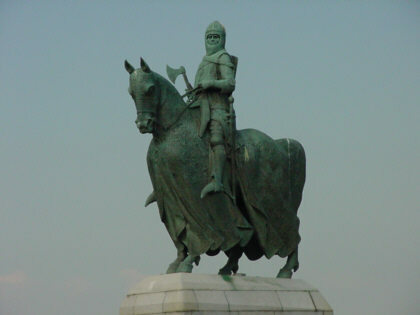 After the death of William Wallace, the Guardian of Scotland, Robert the Bruce carried on where he had left off trying to provide Scots with freedom. It was to this end that, on the field of Bannockburn, in 1314 Robert the Bruce King of Scots led the Scottish army and won their independence from the English. This picture shows Bruce facing the battlefield while behind him stands Stirling Castle.